Embark on the dangerous world of Masked Forces, a virtual world at war where only the best players can survive. In this multiplayer shooter game you must equip yourself with weapons, bulletproof vests and very cool personalized masks. Do not forget to open the chests, contain money with which you can improve and buy weapons for your soldier. If you prefer you can play it in the APP or on any device with an Internet connection. Have a good time fighting in the war where only the best will survive. 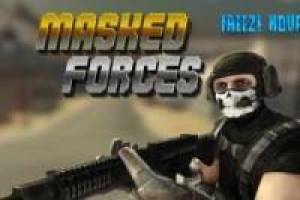 Enjoy the game Masked Forces: A game of Shooter, it's free, it's one of our war games we've selected.